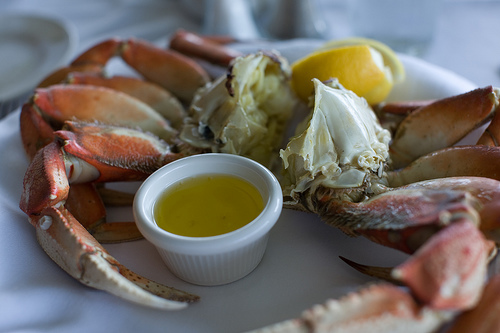 Food Costs > How Much Does a Dungeness Crab Cost? How Much Does a Dungeness Crab Cost? The Dungeness crab inhabits eelgrass beds and the water bottoms on the west coast of North America, from Alaska to the central coast of California. Its name originates from the port of Dungeness, Washington. How much does Dungeness crab cost? On average, the costs will depend on where you live, its size, the time of year, the market conditions and where you’re purchasing. On average, be prepared to pay anywhere from $4 to as much as $9 per pound. In 2016, forum members on ChowHound.com talked about the prices they had paid directly from the docks. According to most responses, the prices were anywhere from $4 to $7 per pound. Fresh crab, as a whole, can cost $25 to $35 per crab. If cooked, it could cost another 10 to 20 percent. The Pike Place Fish Market, for example, sells its fresh ready to eat Dungeness crab meat for $30 per crab. Dungeness crab meat already cleaned and processed can cost upwards of $40 to $65+ per pound. On Amazon.com, for example, the highest rated sellers sell for about $65 per pound, on average. At Costco, when available, wild Dungeness crab, often packed in 10-pound boxes, retails for close to $140. The Dungeness crab has five pairs of legs and grows up to 7.9 inches long or as wide as 9.8 inches across the carapace. It has a wide, long, hard shell, which periodically molts to grow. The taste, often boiled or steamed, has a deep buttery and rich taste, straight out of the shell. A 3.5 ounce serving of crab has 93 calories, 1 gram of fat, 19 grams of protein, 65 mg of cholesterol and 321 mg of sodium. If purchasing online, you may have to pay a shipping fee if you don’t meet the company’s minimum spending requirement. If shipped live, a reputable supplier will ship these crabs inside of a styrofoam box with frozen gel packs to ensure they are live upon arrival. A crab cracker set is highly recommended and can cost less than $15 for a quality set. The crab season will last from December to August. These types of crabs are not harvested during the fall since the shells tend to be softer and there is not as much meat inside. Mature females molt between May and August, and the mating occurs after the female has molted before the new exoskeleton hardens. Then, the males locate the females because of the pheromones, and the younger crabs are produced, which then go through five larval stages before reaching maturity after about 10 molts or two years. Commercial fishermen are only able to keep the larger males. By doing so, this can keep the supply high each year. Crab can last up to six days after being caught. The average Dungeness crab will contain 30 percent of its total weight as meat. The average serving size is one crab, which equates to two-pounds. How long should you cook it for? About 15 minutes if the crab weighs one to two pounds, but closer to 20 minutes if it weighs three pounds, according to the Food Network. If you live near the coastal waters on the west coast, highly consider going to the fishing docks to get the best and freshest price possible. Buying in bulk can often bring the “per pound” price down by more than 20 to 30 percent.